George Scangos spends much of his time these days in an office about 10 miles from the working class Greek neighborhood in Lynn, MA, where he grew up. You could say he’s come a long way in those 10 miles. The kid who didn’t speak English until he went to elementary school, and who didn’t get serious about biology until his mid-20s, is now leading a comeback at New England’s largest independent biotech company, Biogen Idec (NASDAQ: BIIB). “I’ve spent a lot of time here. It feels like home, in a lot of ways,” says Scangos, 63, during an interview at his office in Kendall Square in Cambridge, MA. He did add, though, that after spending the previous 17 years at biotech executive posts in the San Francisco Bay Area, he is still re-adjusting to the seasonal changes of New England. Scangos (pronounced SKANG-goce, with a hard “G” as in “go”), is settling in for at least a few more seasons in New England, as Biogen has mounted a turnaround during his first year as CEO. This was no small feat, given that Scangos was hired to be a change agent at a company that hadn’t introduced any new marketable drugs since 2004. Some decisions were tough to swallow—like cutting 650 jobs, dropping whole lines of R&D, and closing its San Diego research center (originally the home of the Idec part of the company)—but the more focused end result has gotten positive reviews from shareholders. Billionaire investor Carl Icahn, who battled for several years with previous management, has sold his stake in the company to make some big profits. And the company’s stock, after years of lagging biotech peers, has broken out to become one of the S&P 500’s best performers this year. Biogen Idec certainly experienced some good luck during Scangos’ watch, and he’s quick to admit it, like when clinical trials that had begun long before his tenure showed positive results for a new oral multiple sclerosis drug. But those who work with him closely say his leadership style has also played a role in bringing renewed focus to Biogen. Scangos’s path to the top job of one of Massachusetts’ leading companies began in a lower-middle-class section of Lynn, where his paternal grandparents had immigrated from Greece and had settled down with what became a family of 10 kids. His father was an accountant at what later became Exxon, while his mother stayed at home to care for George and one younger daughter. The family spoke Greek in the home, and young George never learned English until it was time to go off to school. There were about 30 cousins nearby, some of whom still live in Massachusetts, Scangos says. Scangos moved with his parents to Connecticut when he was in elementary school, and attended public schools there until it was time for college. He was smack in the baby boom generation, among the group that came of age during the social upheaval of the ’60s. He says he didn’t work very hard at academics, other than French class. 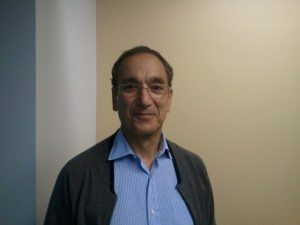 George Scangos’ story is a powerful life story that tells so much about technology, business and the culture that surrounds life science endeavors in our time — well-written, and, it seems still being written. Thank you, Luke, and George. i Hold a sales & Marketing position with Arista power corp.
am very proud & happy to be greek. Thank you Mr Scangos, for the enxample ,that a good education & vision , works. I , father of 3 , two of them with Phds, i am very proud. We the Greeks of diaspora are all proud of the achievements of fellow Greeks such as Mr. Scangos. His story is a lesson to all young people…they should never hesitate to learn different things at a young age because they never know what will turn on their “lightbulb”. And if something was taught by a lousy teacher, take it one more time with a more passionate one.